How dangerous is driver distraction? Phones and cars are not a good mix. Police and government statistics suggest that as many as 34 per cent of all fatal accidents could be caused by distraction. Tests conducted by the Transport Research Laboratory, a not-for-profit organisation involved in transport safety, highlight just how distracting different devices and activities can be when driving. Its experts measured how far a car will travel before the driver applies the brakes at 50mph, when faced with a hazard. In normal driving, the reaction time was 0.9 seconds, and the car had travelled 66ft. Making a hands-free call saw that rise to 1.35 seconds and 99ft. Texting pushed it to 1.8 seconds and 132ft; a handheld phone call was 1.85 seconds and 136ft; a smartwatch was 2.52 seconds and 185ft. And checking social media increased the reaction time to 2.6 seconds and 191ft – as good as three times as long. Remind me: what’s the penalty for using a mobile phone at the wheel? Since March, drivers caught handling a mobile phone at the wheel are hit with a six-point penalty on their licence and £200 fine – twice as severe as before. How does Apple’s Do Not Disturb While Driving setting work? 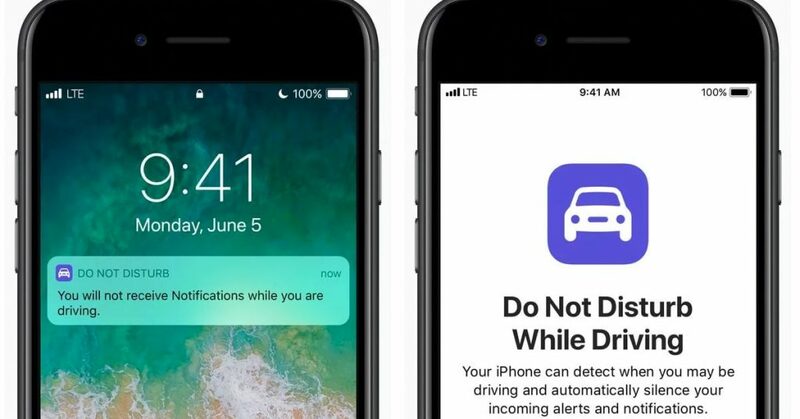 Do Not Disturb While Driving is part of the latest upgrade to Apple’s operating system – iOS 11 – due to be released in the autumn. It is triggered when a driver connects an iPhone to a car through either Bluetooth wireless signals or a USB cable. Even if not connected, Apple claims it can determine whether a user is travelling in a vehicle. With it running, the screen remains dark and phone calls or any notifications for text messages, emails, apps are blocked. In other words, the phone can’t distract the driver. However, the setting allows some of the phone’s functionality to be used within Apple’s CarPlay system, including navigation and music. Once activated, the iPhone screen stays dark and the audible alerts and messages that can pop up on the home screen – known as notifications – are muted and not displayed on the locked handset. Apple’s techies have included an option for users to set up an instant reply, rather like an out-of-office email setting, which can send selected contacts a message to let them know the person is driving. The company says that in the event of an emergency, contacts can reply, using the word “urgent” to get their message through. Apple will release the setting as part of an update to the iOS operating system, this autumn. The American tech company says Do Not Disturb While Driving will be within the Control Centre, which is found under the Settings menu. You simply tap the button icon and once it turns green it will automatically operate when Apple CarPlay is initiated or the phone senses it is travelling in a vehicle. 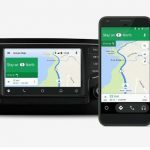 There is currently no one-size-fits-all solution for Google Android smartphones that can prevent driver distraction. However, when using the latest 2.2 version of Android Auto, the equivalent of Apple CarPlay, there is a way to switch off all message notifications. Go into the Settings menu for Android Auto. Look for Messaging, then “Show Notification Messages.” Beneath this will be a toggle switch; turning it off prevents any notifications from texts or apps once Android Auto is running. It’s also possible to turn off phone calls. This can be done by turning on the Airplane mode. However, drivers wishing to use GPS, for navigation, must remember to switch it on within Settings.